Petey and I got an early start today. We left our campground at 7 am to get to Devils Garden Trailhead in the northernmost part of Arches National Park by 8am. I’m not sure if it was my early arrival time or the light drizzle that helped me beat the crowds, but either way, VANilla was one of only four cars in the parking lot when I started my trek. It was a day of seeing arches. I took the trail leading to Double O Arch which connects to several spur routes that shepherd hikers to a variety of arches. Completing every side trip adds up to a 7.7 mile trek along a sandy path, up and down rock inclines, and along rock fins. I ended up walking about 5.5 miles and left out the “Primitive Loop” due to the countless “Danger” signs: “Caution, Dangerous when wet”, “Trail difficult to find”, and “Caution, Difficult Hiking”. Alone, in wet conditions, and with Petey waiting on me in VANilla, today wasn’t the time to test my abilities. While I only missed one arch, I’ll have to come back another time and check it out as the second half of the trail was simply spectacular. Shoes caked in red mud, sitting to slide down a few rocks, and grasping onto rock ridges to lift myself over boulders was all worth it as the phenomenal panoramic view stopped me in my tracks on top of a rock fin which was like walking across the top of train cars only the gaps between the uneven rock were narrow and shallow. 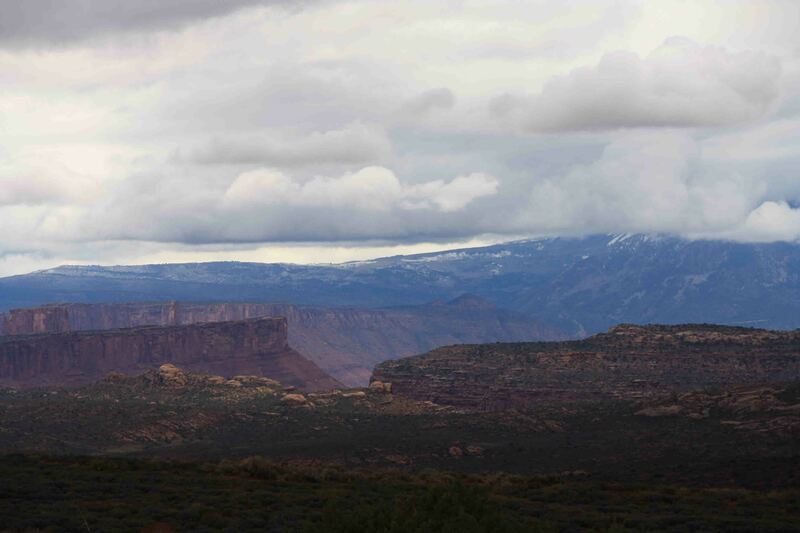 To my left, the view of Salt Valley where green grasslands contrasted with the red stone cliffs surrounding it…To my right, Fin Canyon where rock fins jutted from the landscape beneath a cloud covered sky…Straight ahead, the path continued to Double O Arch. Each arch along the trail and spurs were obviously named for their appearance. Landscape Arch, one of the world’s longest natural arches, spans nearly 300 feet. In 1991, a 60 foot rock slab fell from the arch. When the dust settled, 180 tons of rock debris lay below, thus visitors are no longer allowed to stand beneath the arch. While Landscape Arch may be one of the longest, I think I liked Double O the best, perhaps because I was surprised. I was expecting two O’s side by side. Instead, I found a giant O above a small O. In addition, by the time I reached Double O, the sun poked out through the clouds every once in a while. Also along the trail I visited, Tunnel Arch, Pine Tree Arch, Partition Arch, Navajo Arch, and Dark Angel before returning to Petey and VANilla two hours later where the parking lot was now full! Since it was only shortly after 10am and the weather turned slightly dreary again, I opted for a few more stops before leaving the park by lunch time as it filled with droves of people. I took a short walk to Sand Dune Arch where kids were playing beneath it. The trail to Sand Dune Arch connected to a mile loop trail leading to Broken Arch. The path cut through a grassy valley to what appeared to be half an arch. Upon arrival, I found a full arch through which the trail passed. Despite the fact part of the trail turned through the campground, I enjoyed the stroll simply because of the optical illusion. My final stop was at Panorama Point where snow capped mountains tower above the red rocks and green valley. The mountain peaks were somewhat blocked by the thick clouds, while mystical, I hope I can get a clear view tomorrow. After leaving the park, we spent lunchtime in Moab and took advantage of 3G service which doesn’t exist at my campground before meeting up with Jim for a hike at 3 to see Bowtie Arch and Corona Arch. These arches were outside the national park, so I took Petey along, as he seemed slightly perkier today. We made it far enough to see the arches, but part of the trail requires scaling a rock incline where foot holes were carved into the rock. Petey put the brakes on that! Since our hike was cut short by my old man, we opted for one more quick jaunt to some dinosaur tracks before we grabbed Chinese food in Moab and called it a day. I must say, I am wiped out. It might have to do with missing out on my coffee two mornings in a row. I am so amazed by the places that you are traveling. There are so many I have not heard of and are so beautiful.